Keno involves the player choosing from 1 to 15 (sometimes 20) numbers from 1 to 80. Every five minutes (online casino are faster) or so the casino will choose 20 numbers ranging from 1 to 80. 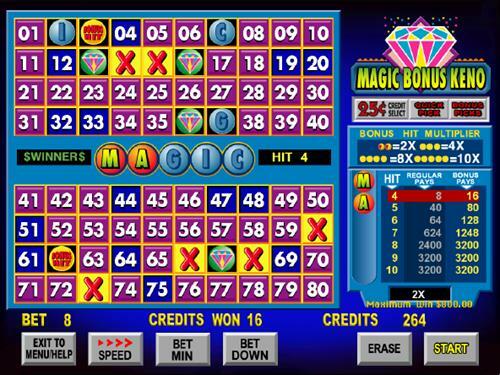 If enough of your chosen numbers match those drawn by the casino then you will win, depending on exactly how many match and the payoff table at your particular casino. While the payoff tables will vary from one casino to another the expected return seems to always range from 70 to 80 cents per dollar bet, making keno among the worst bets in the casino. Many states outside Nevada offer keno as an alternative to lottery tickets. While I can't speak for every state Maryland keno has an expected return of about 50 cents per dollar bet. I believe other state run keno to be just as bad.